Following on from my entry yesterday about the 144MHz AFS Contest, I’ve done some detective work and found out the results from the 1990 contest I mentioned. I finished 12th out of 91 entries in my section and I was part of the Colchester Radio Amateurs group who finished second out of 37 societies. My best DX was DL0WH at 582km. The winner of the single operator section was Andy, G4PIQ who managed over 600 QSOs during the eight hours which is pretty impressive. 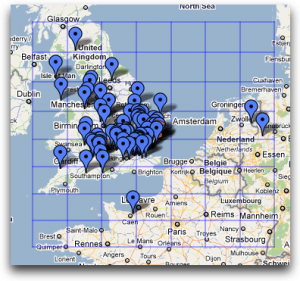 It really saddens me to see how activity in these contests has dropped over the years, as I blogged yesterday, the winner of the single operator section in 2009 had just 173 QSOs which is just over a quarter of those made back in 1990. Anyway, on to this year. I didn’t reach my target of 100 QSOs. I ended up with 77 contacts of which just three of them were Europeans. I worked far more by search and pounce (S&P) than I did by calling CQ. UK activity seemed quite low and even though I spent a fair while beaming towards Europe, only two European stations replied to my calls. I did enjoy this contest – It was very hard work and activity was much lower than I expected but I’ve not done any contesting from home since September so it was nice to spend some time in front of the wireless and squirt copious quantities of RF into the ether for an extended period. I don’t think I’ve done especially well overall but my points will be useful to Colchester Radio Amateurs. There’s one very good thing about contests these days compared to back in 1990; the results for the 1990 144MHz AFS contest were published in the March 1992 issue of RadCom. We now generally get results of contests within a couple of months rather than the one year and three months it took back then!